FILE - Former Trump national security adviser Michael Flynn leaves a federal courthouse in Washington, July 10, 2018, following a status hearing. The arguments to the judge echoed those of special counsel Robert Mueller's office, which last week said that Flynn's cooperation — including 19 meetings with investigators — was so extensive that he was entitled to avoid prison when he is sentenced next week. Flynn, who pleaded guilty of lying to the FBI about conversations during the presidential transition period with the then-Russian ambassador to the United States, will become the first White House official punished in the special counsel's probe into whether the Trump campaign coordinated with Russia during the 2016 presidential election. 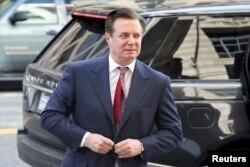 The filing came as lawyers for former Trump campaign chairman Paul Manafort said they were still deciding whether to dispute allegations that he lied to investigators and breached his plea agreement. A judge gave Manafort until Jan. 7 to respond to prosecutors' claims that he misled them about his interactions with an associate who they say has ties to Russian intelligence and with Trump administration officials. The defendants, their fortunes sliding in opposite directions, represent starkly different paths in Mueller's investigation — a model cooperator on one end and, prosecutors say, a dishonest and resistant witness on the other. Even as prosecutors recommend no prison time for Flynn, they've left open the possibility they may seek additional charges against Manafort, who is already facing years in prison. Given both men's extensive conversations with prosecutors, and their involvement in key episodes under scrutiny, the pair could pose a threat to Trump, who in addition to Mueller's investigation is entangled in a separate probe by prosecutors in New York into hush-money payments paid during the campaign to two women who say they had affairs with the president. In Manafort's case, prosecutors have accused him of repeatedly lying to them even after he agreed to cooperate. They say Manafort lied about his interactions with a longtime associate they say has ties to Russian intelligence, his contacts with Trump administration officials and other matters under investigation by the Justice Department.